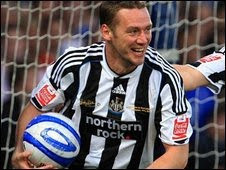 Kevin Nolan scored a hat-trick as Newcastle thrashed Ipswich to move two points clear at the top of the Championship table on an afternoon rich in drama and emotion at Portman Road. There were generous tributes to former Ipswich and Newcastle manager Sir Bobby Robson before the match and during half-time. But three goals in four first-half minutes from the visiting team ensured that it would be another miserable afternoon on the pitch for Roy Keane's team. Nolan opened the scoring with a header and quickly added to that with a composed finish. Ryan Taylor's free-kick ended the quick-fire scoring spree and ensured the game was over as a contest by the break. Nolan's second header of the match shortly after the restart completed his hat-trick and left Keane looking furious as he watched from the home dug-out. Ipswich have yet to win in the Championship this season and have now made their worst start to a league campaign - a sequence that increases the pressure on Keane to rapidly find a winning formula. "Clearly we are disappointed. We started alright but the first goal knocked our confidence. "You have to persevere and encourage players. "We have given teams a helping hand and we can't keep doing it. "I'm sure Kevin Nolan thought it was Christmas with the first goal and before we knew it we were three down. We certainly have to defend better. "I don't like losing football matches, the expectations are high but we have got to deal with it and get on with it." "I am delighted with the approach with which we went into the game. From start to finish we were excellent. "The lads showed a great desire. We were fortunate enough to get the goals early enough to let us go on."